But, it’s no fun to criticize a cartoon! To follow Squared Away in 2018, please join our free email list. You’ll receive just one email each week – with links to the two new posts for that week – when you sign up here. Well, Steve Sass may be mis-reading the intent of the cartoon. 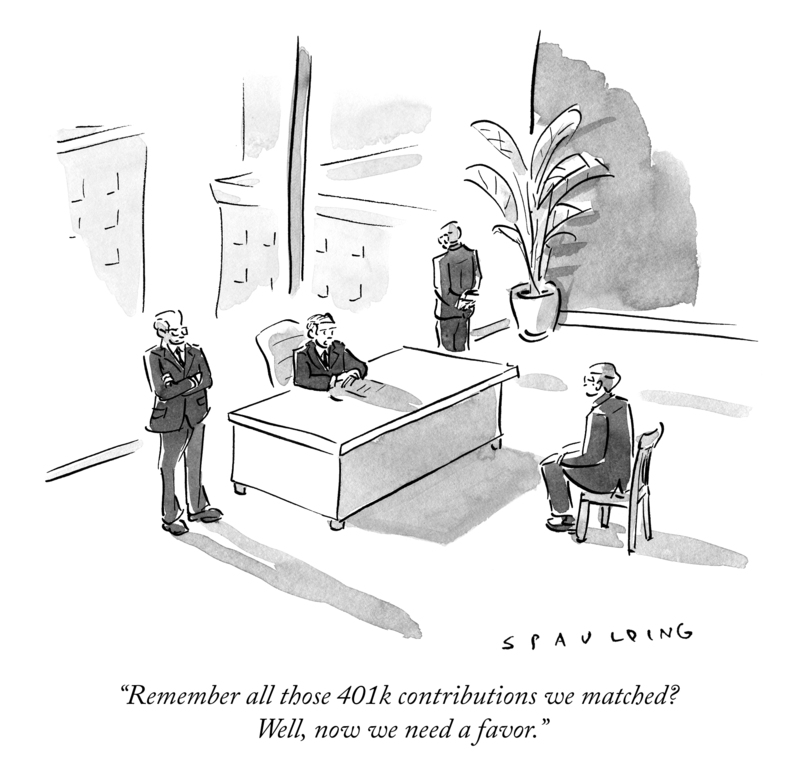 The employer may not be asking for a favor in return for a favor, as suggested by Steve, but pointing out the situation of the company where the 401k (I assume “matching”)contributions are not allowing the company to move forward in other areas, if at all. Is there a possibility that 401ks and their contributions may be in jeopardy by some other arrangements? The cartoon hints that arbitration may be afoot someplace, some how. Must an employer match, if offered, be uniform across payroll, or can some employees be offered a higher percentage than others? Great question! I do know that employers face strong anti-discrimination provisions when deciding how to design 401ks among employees… Offering different things to different people could cause them problems. But I am unfamiliar with whether there are ways to get around it. You’d have to ask an employer expert!